Debt ceiling crisis averted; now what? The game of chicken is over, and Congress and the president found a way to avoid putting the United States in default on its obligations. It was an ugly few weeks, and I expect there’s more ugliness to come as discussions continue on finding more ways to restore fiscal sanity on the national level. It will be up to us as citizens to continue to stay involved. We need to be more knowledgeable about how we got where we are and what strategies are available for strengthening our financial position. Here’s one data point for your consideration. The infographic below ran recently in the New York Times. It is built on data from the Congressional Budget Office. 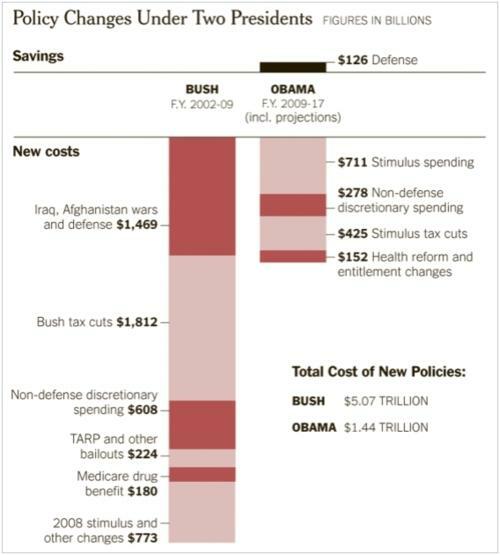 As you’ll see, the Bush tax cuts account for a large portion of the buildup of the debt. I don’t see how you can look at this and not see the wisdom of letting these cuts expire. Even Grover Norquist, the man behind the no-tax pledge so many in Congress have signed, has said that letting the tax cuts expire would not be a betrayal of the pledge. We should do it! What are your thoughts about putting our financial house in order? This entry was posted in Politics and tagged debt-ceiling crisis, federal budget, fiscal responsibility. Bookmark the permalink.